A box cutter is often an overlooked tool that should be essential in every homeowner’s chest of goodies. It should be right in there along with a hammer and screwdriver. There are several times almost daily that a box cutter can help you in a time of need. It is the perfect time to make a small investment and get a quality box cutter for these reasons listed below. More people seem to do online shopping nowadays rather than going to brick and mortar stores. This is 21st-century shopping at its finest. The problem is how to carefully open these packages when they arrive at your doorstep. Taking a knife to these boxes will leave you damaging whatever is in it. A box cutter can quickly and safely open these packages in mere seconds without harming the products inside. No one ever likes to think about their home being invaded by a thief or a trespasser. There are those that hate having firearms anywhere inside the house. Having a box cutter could be a good alternative. Of course, it is not a sword or anything like that, but it can do some serious damage when an intruder is within arm’s reach. 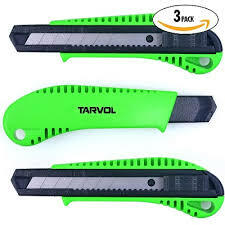 A box cutter is something that you can carry around easily for home improvement projects. Have you ever needed a pair of scissors to trim wires, lines, or rope around the house? A box cutter can handle these jobs much easier than a pair of scissors. You will be left wondering how you managed to make it all these years without one. No matter how careful the painters were when painting the inside or outside of your house, they are bound to get some on your windows. Instead of looking at that same paint splatter for the next couple of decades, simply use your box cutter to quickly scrape it away. Just when you thought you had that whole gift wrapping thing figured out, here comes the box cutter to make your job easier. Cutting wrapping paper with scissors can be difficult as it has a habit of bunching up on you. A box cutter can allow you to make a few quick slices and your paper is ready to go. Whether it is for birthdays or holidays, the box cutter has you covered.